Was previously used in a 35mm film projector. Glass looks clean and free of any scratches. Exterior has some scratches and scuffs from being slid in and out of the projector. The Bausch and Lomb anamorphic adapter lens is an excellent choice for budget anamorphic videos. Focusing movies easy and smooth. RCA Somco 16mm Anamorphic Projector Lens Original Box f1.4-2" EUC! Excellent condition, barrel turns smoothly but is a bit stiff. Vintage Cinema Scope Gaumont Kalee Anamorphic Type P Projector Lens In used untested condition. GREAT HiLUX Variable VAL anamorphic Lens. SUPER RARE SINGLE FOCUS ANAMORPHIC ! FRONT PRISM VERY GOOD FEW VERY SHAKY [ LENS BULKY & VERY HEAVY for LEFT HAND - 4700g]. SINGLE FOCUS MODE. NO DEAD FUNGUS SPOT are INTERFIERING with IMAGE. HiLUX Variable 152 anamorphic PROJECTION Lens. SUPER RARE SINGLE FOCUS ANAMORPHIC LENS ! FRONT PRISM VERY GOOD HAS TINE SPECS of OUTER DUST. VG near EX WORKING SHAPE for Those OLDIES. SINGLE FOCUS MODE. LOMO 35-NAP2-3M 80-110 mm. Anamorphic ratio is 2x for infinity focus. Applicable for lenses between 80 & 110 mm focus. Russian PROJECTOR. The lens is inVERY GOOD working condition. Scale of distances: 9, 14, 16, 18, 20, 22, 25, 28, 32, 35, 40, 45. An Anamorphic Projector Lens with a 2X squeeze. ISCO Ultra-STAR CINEMASCOPE. ANAMORPHIC COMBO LENS in near EX cond. 85mm PROJECTION LENS with INFINITY FOCAL PLANE about 50mm . As TAKING LENS VERY WELL. GLASS EX CLEAN, CLEAR with. You are buying a pre-owned Schneider ES Cinelux Anamorphic Super Projector Lens in very nice working condition! This lens is in beautiful shape. The gold finish is in almost like new shape with just a few minor scuffs. The anamorphic lens for the film projector LOMO 35NAP2-2 F 80-120. There are no external injuries. 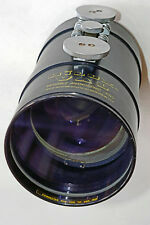 This Lens was made in USSR at the optical plant LOMO in the 1960s. It is Soviet Nozzle anamorphic projection lens. This Nozzle is designed to demonstrate of 35 mm anamorphic widescreen movies. This Lens is in good condition. Made in Goettingen (Göttingen), Germany. The dark-colored residue on the exterior of the lens is tape glue, as projectionists used to tape reminders to the lens. All photos are photos of the actual item for sale. ES Cinelux Lens with Integrated Anamorphic. Schneider Kreuzenach. 35mm Motion Picture Projector Lens. Don't miss this wonderful o.
Bausch & Lomb. Don't miss this wonderful opportunity! Don't miss this wonderful o.
ISCO Ultra Star HD Plus. Integrated Anamorphic. 35mm Motion Picture Projector Lens. A Division of. Don't miss this wonderful o. Will fit most 35mm Cinema Projectors. and require cleaning. NICE OPTICS! The anamorphic lens for the film projector LOMO 35NAP2-3M F 80-110. There are no external injuries. Cinelux Anamorphic MC 2X. Cinelux-Ultra 2/75mm-2.95in MC, 35mm Film Lens. See Photos. Have little area of tiny dots at bottom of front lens (see pic. ). Compact Integrated Anamorphic. Focal Length 60mm. 35mm Motion Picture Projector Lens. Condition: USED. Don't miss this wonderful opportunity!